On Oct. 17, Canadians will be able to use and buy recreational cannabis legally. But it won't be a free-for-all. In a few days, you'll be able to legally buy and consume cannabis in Manitoba — but there are plenty of rules to dictate exactly how you can do that. On Wednesday, Canada will become the first country in the G7 to legalize cannabis on a national level. It won't be a free-for-all: Ottawa and all the provinces will still enforce rules on its use, and those rules will differ from province to province. Here's what we know so far about how it's going to work in Manitoba as of Oct. 17. To start with, Manitobans who want to use cannabis have to be 19 or older. Assuming you're of age, you'll be allowed to carry up to 30 grams of dried cannabis on you in public — but carrying more is illegal. That means 30 grams is the most you'll be able to buy at one time. Under provincial rules, you also won't be allowed to smoke or vape it in public. The Non-Smokers Health Protection and Vapour Products Act will prohibit recreational users smoking or vaping it in public places — indoor and outdoor — including workplaces, group living facilities, streets and sidewalks, parks and beaches, school grounds, restaurant patios and the grounds of health-care facilities. An exception will be designated rooms in hospital palliative care units or end-of-life hospices. As well, the owner of a group living facility can designate a separate smoking room in the facility. Hotel owners can do the same. You can, however, smoke or vape in a private residence, including your yard, the province says. 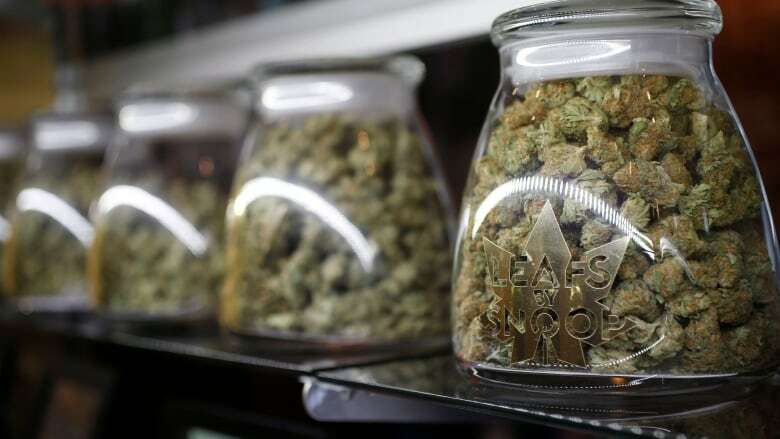 It's unclear what the province's rules will mean for renters whose landlords don't allow marijuana smoking inside, and who won't be allowed to smoke outside their apartment blocks. Medical users will be subject to rules similar to those around tobacco, Health Minister Cameron Friesen said Tuesday. Unlike recreational users, medical cannabis users can smoke or vape in outdoor public spaces, provided they are eight metres from any building with a public access. Restaurants, bar patios or decks. Stadiums or outdoor entertainment venues. Wading pools, splash pads or water parks. Bus shacks or similar structures to which the public has access. Friesen said information about fines for medical users who break the rules will be released shortly. Federal rules won't allow retail of edible cannabis products right away, but you're still allowed to make your own. Manitoba rules don't explicitly ban consumption of edibles other than in vehicles, boats and schools, but Premier Brian Pallister has said he's considering closing that loophole. In Manitoba, you're going to have to buy your cannabis because provincial rules don't allow you to grow it at home. The federal legislation, however, allows growing up to four plants at home — which has led some experts to suggest Manitoba's home-growing ban may be open to a court challenge. Last year, the province announced it will use a hybrid public/private model for legal cannabis, meaning the Manitoba Liquor and Lotteries Corporation will purchase cannabis from licensed producers and deliver it, or arrange for delivery, to approved, privately operated retail cannabis stores. 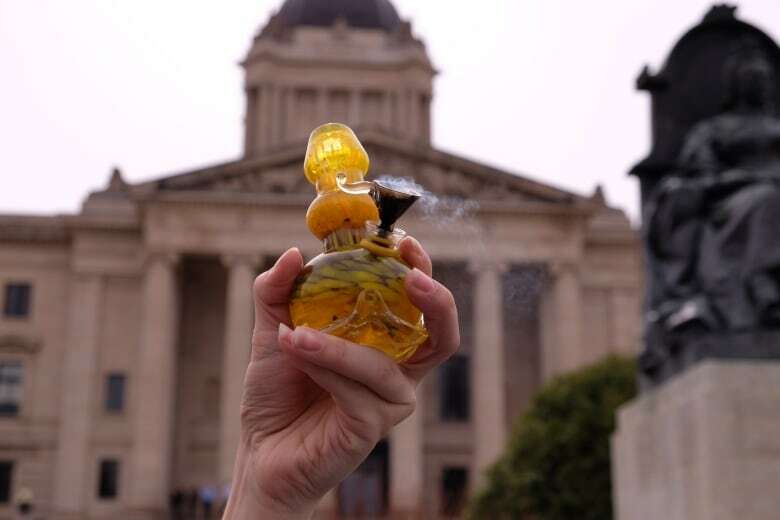 The provincial Safe and Responsible Retailing of Cannabis Act says retail will be regulated by Manitoba's Liquor, Gaming and Cannabis Authority, while Manitoba Liquor and Lotteries will administer order processing and distribution to authorized retailers. To be authorized, retailers must pass muster with the Liquor, Gaming and Cannabis Authority of Manitoba. After a request for proposals in February, the province selected four retailers, and another request for pre-qualifications to expand opportunities closed in August. The province has said 12 retail stores have completed most of the regulatory hurdles to open so far. Delta 9 Cannabis Inc. and Canopy Growth Corporation, which are in partnership and will provide product to each other's retail locations. National Access Cannabis, in partnership with several Manitoba First Nations, including Brokenhead Ojibway Nation, Opaskwayak Cree Nation, Long Plain First Nation, Nisichawayasihk Cree Nation and Peguis First Nation. Garden Variety, a consortium involving Avana Canada Inc. of Ontario, Fisher River Cree Nation of Manitoba, Chippewas of the Thames First Nation of Ontario, MediPharm Labs of Ontario, and U.S.-based retailer Native Roots Dispensary. 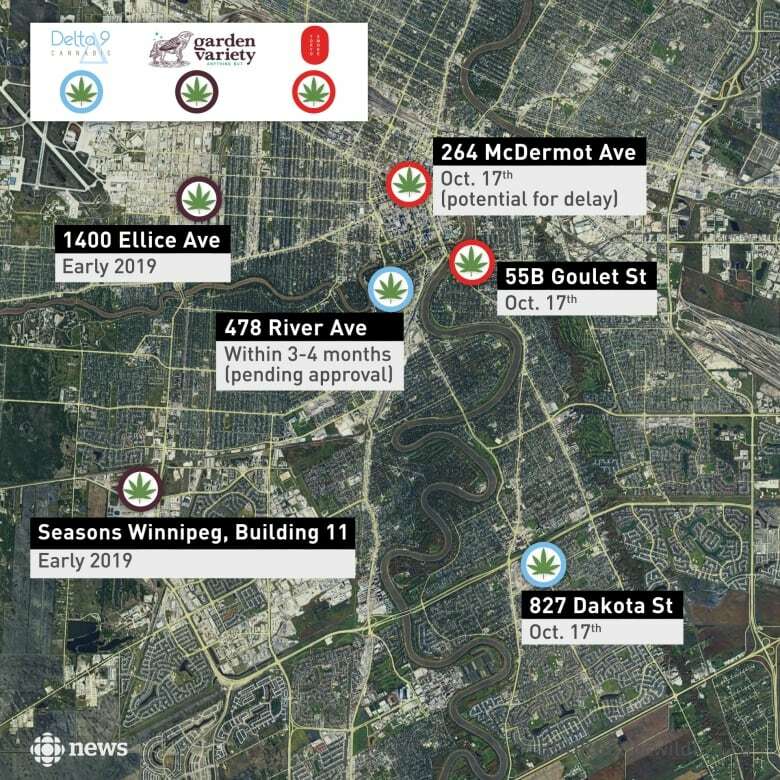 Tokyo Smoke, a subsidiary of Hiku Brands, which is also owned by Canopy Growth Corp.
Delta 9 hopes to have one location in Winnipeg open on Oct. 17, at 827 Dakota St. in St. Vital. A second location is expected to open within three to four months at 478 River Ave., although it still needs site-specific approval from the province. The company also has plans for a location in Thompson's City Centre Mall, and another in downtown Brandon. Tokyo Smoke said it will have at least one Winnipeg store open on Oct. 17 — located at 55B Goulet St. — and expects a second location at 264 McDermot Ave. will also likely be open on that day. It plans to open more locations in the city down the line. A spokesperson for National Access Cannabis said the company couldn't share its planned locations as of Oct. 12, but that they would be announced shortly. Eventually, in an effort to eliminate the black market, the province says its goal is for 90 per cent of Manitobans to have access to legal cannabis within a 30-minute drive or less. In July, Manitoba Minister of Growth, Enterprise and Trade Blaine Pedersen said the province hopes to achieve that within two years of legalization. According to provincial rules released earlier this month, stores will be required to do background checks on employees — although a criminal record won't necessarily disqualify candidates. Stores also won't be allowed to offer free samples. In fact, customers won't even be permitted to touch the product before purchasing it. Stores can't sell plants or seeds, take returns or sell more than 30 grams of dried cannabis or the equivalent to a customer. They can't be open between midnight and 8 a.m. The rules require stores to display certain public service notices — such as information about safe consumption — as well as install video surveillance system with clear, colour, time-stamped images of all interior areas. Employees will have to complete the Smart Choices training course, offered in-class by authority inspectors, and verify all customers' ages using photo identification. Stores must also maintain records of inventory, including data on product received, available for sale, sold, not available for sale because it's on display, subject to a recall, or disposed of. Eight Manitoba communities will ask residents to vote in plebiscites on whether to allow cannabis retailers in town. The plebiscites will be held on Oct. 24, when voters were already scheduled to go to the polls for municipal elections in the communities of Winkler, Steinbach, Lac du Bonnet and Snow Lake, and the municipalities of Stanley, Stuartburn, Riding Mountain West and Wallace-Woodworth. Councils in two other communities — Hanover and Minto-Odanah — voted against permitting retail sales, but the ban would require a referendum. Last month, Ottawa approved its first roadside testing device to screen drivers for drugs — the Drager DrugTest 5000, a handheld device that tests saliva for THC, the main psychoactive ingredient in cannabis — although concerns have been raised about the accuracy and invasiveness of the test. Under Bill C-46, police will have the right to conduct roadside saliva tests of drivers they suspect to be under the influence of drugs. The federal government has earmarked $161 million over five years for police training and drug-testing equipment. The Drager manufacturer has 500 devices available for the country, but due to limited funding and supply Manitoba is expected to acquire only 21 of them by the end of the fiscal year. Over the next five years, the province plans to allocate $840,000 in funding from Ottawa to buy 111 devices. Justice Minister Cliff Cullen said the province's largest police services — the Winnipeg Police Service and the Manitoba RCMP — want to use the devices. Police services in Rivers and Morden have also confirmed they'll use the Drager device . In the meantime, police detachments will continue to rely on officers with training to detect drug impairment by observation, as will police forces with concerns about the device's reliability in cold temperatures. According to federal rules, a driver who is found to have between two and five nanograms of THC per millilitre of blood could face a maximum fine of up to $1,000. Manitobans will also be prohibited from consuming the drug in motorized vehicles on a highway, under Manitoba's Highway Traffic Act. 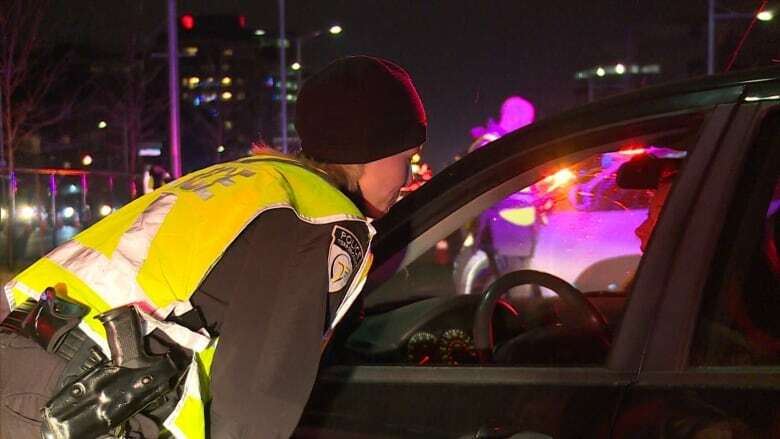 Recent changes to the act will give police officers the authority to suspend a driver's licence for 24 hours if the officer believes the driver is under the influence of a drug and unable to safely operate the vehicle. The act also requires the registrar of motor vehicles to determine if drivers should face further consequences following the suspension — meaning Manitoba Public Insurance could impose its own penalties. If you want to take cannabis with you in the car, provincial rules require it to be stored in a secure compartment, like the vehicle's trunk, so that it's inaccessible to people in the vehicle. Exceptions are made for cases where the vehicle is transporting somebody for compensation (taxicabs, for example) and the cannabis is in the possession of a passenger and in that person's personal effects. The province has said multiple times it wants to keep pot prices competitive to avoid driving customers to the black market. In December, Ottawa suggested a price of around $10 per gram. But federal Public Safety Minister Ralph Goodale said in February the price point hadn't been finalized and will ultimately be determined by market circumstances. According to the province's Budget Implementation and Tax Statutes Amendment Act, Manitoba won't charge sales tax on recreational cannabis. Manitoba Liquor and Lotteries will apply markups of 75 cents per gram on recreational cannabis, plus an additional nine per cent, for retailers — who will also pay six per cent of their revenues as a social responsibility fee to the government. Ottawa is also adding an excise tax to cannabis, revenue from which will be split 75-25 between the provinces and the federal government. As usual, breaking federal rules on cannabis will land you criminal charges. Breaking provincial rules will net you a fine, varying based on the offence. Recent provincial legislative changes will allow Winnipeg police cadets and some other types of civilian officers to enforce cannabis laws, along with police officers. Smoking pot in a provincial park or campsite comes with a fine of $672, including court costs and other surcharges. The same fine will apply to people under 19 who are caught consuming or in possession of cannabis. Growing the plants at home, supplying the drug to an underage person or selling it without a licence will bring fines of $2,542. The fine for homegrowing has been criticized by some as overly high, but the province says it's the same as the fine for illegally producing liquor. 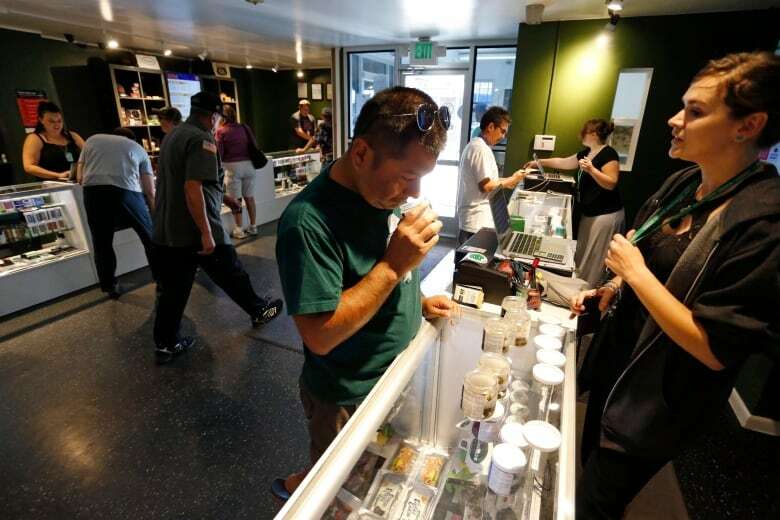 We initially reported that Tokyo Smoke was no longer on the list of retailers because Hiku Brands had been bought by Canopy Growth Corp. In fact, Tokyo Smoke continues to operate as a subsidiary of Hiku Brands, which is a member of the Canopy Growth family of companies, and is opening stores in Manitoba. (Corrected Oct. 2, 11:25 a.m. CT) We initially reported that Delta 9's 827 Dakota St. location would open within three to four months of legalization. In fact, it will open on Oct. 17. (Corrected Oct. 15, 2018, 11:29 a.m. CT.) We initially reported that the province suggested a price of $10 per gram. In fact, it was the federal government.